Corn growers in Ontario and Quebec have a new tool to use against key insect pests. DuPont Crop Protection announced in June that the Pest Management Regulatory Agency (PMRA) has granted approval for registration of DuPont™ Lumivia™ insecticide seed treatment. Lumivia™ is a new seed treatment product for corn that delivers broad spectrum pest protection and efficacy. It protects corn against early-season, below-ground insect pests such as wireworms and seed corn maggots, as well as foliage feeders including cutworms and armyworms. Lumivia™ is expected to be commercially available for the 2017 growing season. James Ferrier, an Alma, ON farmer, technical services manager for Nufarm, and certified crop advisor, uses twitter to share what he sees in the fields. He has garnered more than 1,200 followers since joining twitter in 2011. Every day, hundreds of users check www.gfo.ca for quotes from local elevators on corn, soy, and wheat — the Daily Commodity Report is one of the most popular pages on the site. 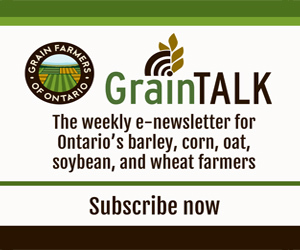 Recently, Grain Farmers of Ontario has also started to provide quotes for barley and oat crops. Barley and oats have been represented by Grain Farmers of Ontario since July 2015, and ever since it has been a priority to include pricing data in our popular Commodity Report.